Nature has always been our closest ally. During this special time of year, the waning light of summer and early autumn aromas instill a feeling of excitement and beckon us to gaze and contemplate its quiet beauty. Now in its 27th year, Carrie Haddad Gallery continues to honor the tradition of landscape painting in the Hudson River Valley with a group exhibit of esteemed, local landscape artists. Each work presented here reveals something slightly different about how we all interact with the land and perceive its role in our personal lives. For some it evokes nostalgic memories of the past, for some it’s a cautionary tale of how our environment is ever changing, for better or for worse, into the future. Sweeping vistas in honeyed color and charcoal drawings of tree creatures will show alongside torched drawings on wood panel of skinny birches and black and white photographs. Selected artists include Tracy Helgeson, Sue Bryan, Eileen Murphy, Jane Bloodgood-Abrams, Harry Orlyk, Paul Chojnowski, David Konigsberg, Forrest Burch and John Kelly. 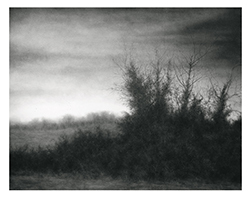 An exhibit of black and white landscape photography by Betsy Weis will be on the second floor. Capturing the View will be on exhibit November 7 through January 6th with a reception for the artists on Saturday, November 10th from 5-7pm. All are welcome to attend!